Make 4 payments of $5.36 over 8 weeks and get it now! Sleeping is the time for the body to recover from the day's activities both physiologically and psychologically. Without sufficient protein this cannot occur. Before bed we generally do not consume protein. Without protein your body is unable to achieve an anabolic state. 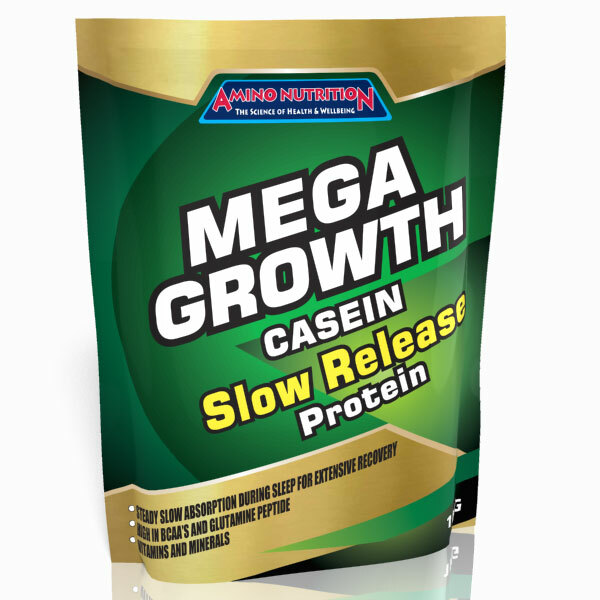 With Mega Growth you have the slowest release protein to provide your body with the complete ingredients for growth and recovery while you are sleeping. 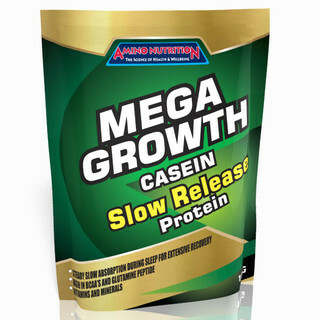 Mega Growth provides your body with a slow release micellar casein for maximum protein uptake while you sleep. This maximises growth and recovery. Simply blend 30g (1 heaped scoop) with 200mL of low fat milk, chilled water or soy milk. Can be added to any plain yoghurt, cereals, mousses, cakes, muffins, pancakes, strews or soups by sprinkling on and stirring through at appropriate times. One serve per day depending on the daily requirements of your dietary and exercise program. This product is sweet but I use it to mix with unsweetened whey protein which works wells together. The essential aminos are very important food for the pituitary gland and all the other glands in your brain to work efficiently for your growth, repair and maintenance of all the other glands in your body, Thyroid, Pancreas, Liver internal organs etc.. So 'the Aminos are also cornerstone for rapidly reducing your weight'. I have dropped a full dress size within two weeks of taking this product at 2 tablespoons per day with a glass of light milk (not the watery milk with all the goodness stripped out of it) as there is a full spectrum of amino acids in your milk that increase the effectiveness of any amino acid drink, it must be taken in milk. You can exercise till you drop, it won't make an ounce of difference if you are depleted in your aminos, you will only make yourself age faster and make yourself sick. Everyone must have at least the essential aminos, especially if you exercise and/or are sick, in order to make a rapid recovery and even if at all if you are sick. My recommended daily intake RDI is 2 tablespoons twice per day, before my daily swim and early evening before bed time to thicken my hair, restore its colour and continue loosing weight, in other words have my body transform to what it should be when healthy. You will find your RDI at this amino calculator link: http://www.globalrph.com/aminoacid-rda.htm But at two tablespoons you will defiantly see and feel an improvement and If you can't handle 2 glasses of milk per day, drink I glass of milk with two tablespoons of this product and take two Complex Amino Acid tablets will do as the key is the high doses of the Essential Amino Acids, which are indeed ESSENTIAL for a healthy body in growth (maintenance of change) and repair. We forget that new born baby's are raised on this. I think the product is excellent. I am not a great meat eater and constantly forget about protein. I'm usually reminded of the necessity of protein when muscle pain starts. I made a shake with the product when it first arrived and a few hours later I felt so much better. Drink it on a regular basis now and have more energy and sleep better. Also no more cravings and I lost 3kg within 2 weeks without trying.